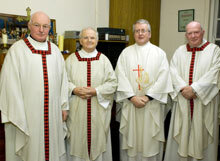 A special celebratory Mass to say Goodbye to Fr Donal M O’Connor & Fr Tom McNamara and to welcome Fr John Browne & Fr Eddie Deeney to the parish was celebrated in Our Lady of the Rosary & St. Patrick Church, Walthamstow, London on Saturday, 27 January 2007. Tributes were paid to the outgoing Parish Priest and the Assistant Pastor. Warm words of welcome were extended to the new Parish Priest and the Assistant. 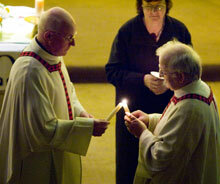 The handing on of the baton was symbolised in the exchange of candles between the priests and the people. 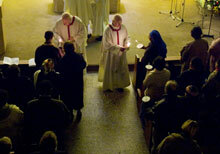 In 2009 Fr Deeney was replaced by Fr Mariusz Rarak, a diocesan priest working in Association with the Polish branch of the SMA. Fr Mariusz was a missionary with the SMA working with the Pygmy peoples of Berberati, Central African Republic from 2003 to 2008.